Few homebuilders pay dividends. Of the handful that do, M.D.C. Holdings, Inc., PulteGroup, Inc., and D.R. Horton, Inc. are the ones with the best yields, and the most likely to increase payouts over time. Homebuilding is a very cyclical industry, experiencing significant swings in demand as economic conditions change. That's why very few companies in the industry pay dividends. And of that group, only a handful have been able to increase those payments in anything close to a consistent manner over the years. However, there are still some worth taking a closer look at -- particularly M.D.C. Holdings, Inc. (NYSE:MDC), PulteGroup, Inc. (NYSE:PHM), and D.R. Horton, Inc. (NYSE:DHI). Not only do all three have a long-term track record of dividend growth, but there are also signs that homebuilding is set to pick up in coming years, and for a number of reasons. Keep reading to learn what sets these three apart. It's been pretty tough to be a homebuilder over the past decade. After years of very strong demand (much of which, in retrospect, was artificially created demand), new home construction absolutely collapsed right before the Great Recession, sending housing starts plummeting to the lowest levels in better than a half-century. And even after years of relatively steady growth, new home construction activity is still below historical averages of around 1.5 million new homes per year. The biggest driver of this trend in recent years has been a lack of new-home buying among millennials. So far, this generation has stayed at home or cohabitated with friends for far later into life than any prior generation. But there's some evidence that this trend is shifting, as millennials appear to be following the same patterns of marriage, having kids, and yes, buying homes, as prior generations, just later in life. One major factor in this shifting trend is the slow -- if steady -- improvements in the U.S. economy over the past half-decade, which has included jobs growth, and more recently gains in wages. This new market is set to drive significant growth for homebuilders in coming years and could help return construction activity back to historical levels. 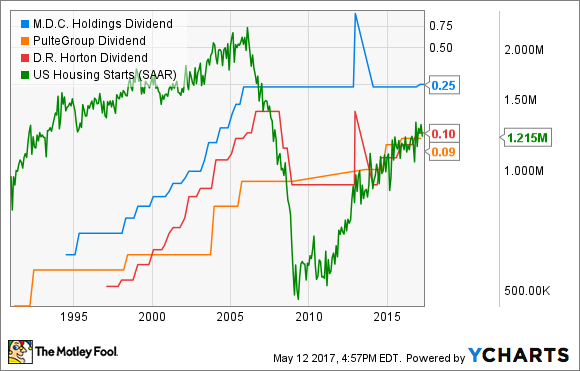 And while Horton gave some of that dividend growth back over the financial crisis, it has managed to recover its a payout, to some extent, while M.D.C. has held it steady, paid a one-time special dividend a few years back, and recently increased its regular dividend 5%. PulteGroup was actually able to increase its dividend several times since the financial crisis. The biggest risk to these companies is simple: If the economy turns soft, home sales will be one of the first things to slow, leaving homebuilders in the lurch with unfinished and unsold properties under development. But as things currently stand, the fundamentals don't suggest there's much risk of seeing that happen in the short term. Since the end of the Great Recession, the U.S. economy has steadily grown stronger, adding jobs and, more recently, seeing workers report increased earnings. 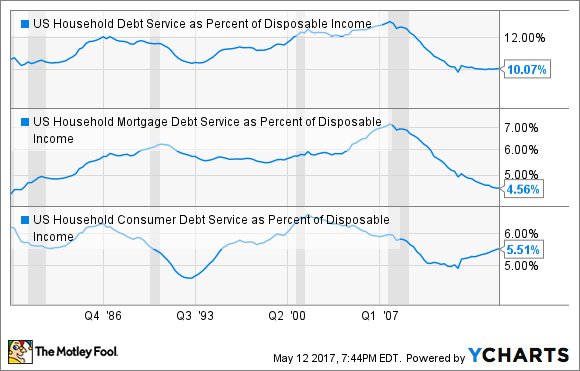 At the same time, consumer debt, as a portion of disposable income, is also still well down from the pre-recession peak and below historical averages. Generally speaking, low household debt levels have corresponded in the past with an increase in housing starts. Furthermore, the economy continues to show signs of strength. Unemployment is at its lowest level in more than a decade, and the few recent upticks have been a product of having people who've been out of the jobs market come back to find work. At the same time, recent income data has offered positive signs, with incomes rising for many workers, an indication that the jobs market is getting more competitive as employers compete for workers. Millennial homebuyers could lift homebuilder's prospects in a big way. Image source: Getty Images. These three homebuilders all pay modest dividends, and if the housing market continues to strengthen on the back of a healthy and growing economy, and more millennials finally join the homeownership ranks, there's a good chance those dividends could grow. There's also a solid opportunity for capital appreciation, as profits grow and more investors return to homebuilders. Lastly, the stocks for these three are reasonably priced, and maybe even cheap. On an earnings basis, M.D.C. Holdings trades for 15.6 times last year's earnings, while PulteGroup and D.R. Horton trade for around 13 times. 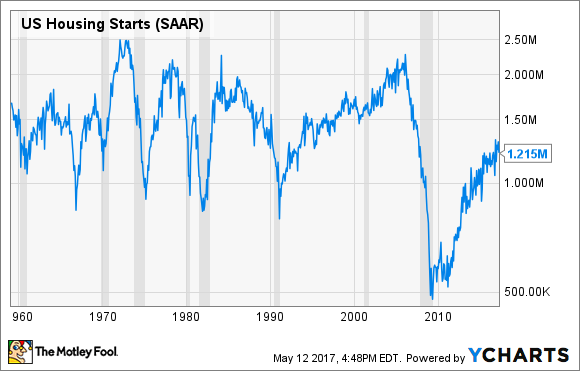 Looking ahead a few years, investors willing to ride out the market's ups and downs could do well. Just remember that an economic downturn, or some other unexpected shock to the financial system, could be painful in the short term. If that were to happen, though, it would probably create an even better opportunity for investors to add shares.